When I gave up dairy, I was saddened to find that pesto was off-limits. Like many folks, I’d assumed it was a non-dairy food. While perusing labels, I discovered that parmesan was a key ingredient in every container of store-bought pesto. Was it even possible to make pesto without cheese? I needed to learn, and fast. I loved pesto way too much to remain ignorant. Sautee the pine nuts in a bit of olive oil until they are slightly brown, but not burned. 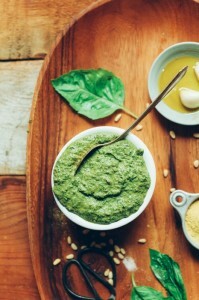 Pour the remaining olive oil into a blender or food processor, then added the pine nuts, minced garlic, yeast, salt and pepper and basil leaves. Flip the switch and blend until smooth. That’s all there is to it! Serve over fresh, gluten-free noodles, and sprinkle with vegan parmesan cheese for an additional treat. This concoction is so much better than store-bought varieties. Your taste buds will thank you, and you’ll wonder where this recipe has been all your life. If you’re on a tight budget, substitute sunflower seeds for pine nuts. Pine nuts can cost up to $40.00 a pound, but sunflower seeds are about $2.00 a pound. That’s an enormous difference! Your pesto will taste just as delicious with sunflower seeds, and your friends and family won’t know the difference. If you want to get fancy, and/or add more nutrients to your pesto, toss in some arugula, chard, red pepper, and/or kale. If you have leftover pesto (and you almost certainly will, because this stuff is rich), purchase some gluten-free pita bread, fresh vegetables, and vegan mozzarella cheese. Spread the pesto liberally on the pita and cover it with grated cheese. Add the vegetables of your choice, and maybe some vegan pepperoni. For an extra-fancy touch, sprinkle a few diced basil leaves on the top, and a little fresh oregano. Bake in the oven at 425 degrees for 10-15 minutes or until the edges of the pita bread are crispy. You won’t believe how good this pita pizza tastes! 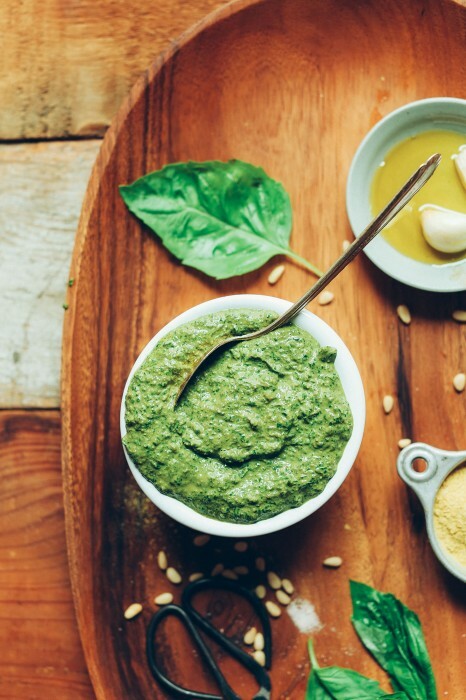 This vegan, gluten-free pesto is absolutely delicious, and 100% plant-based! Your taste buds will thank you as you devour this incredibly rich concoction. Yum! I’m gonna try this Leah, thanks!